What can you do in a store that you can’t do via online shopping? Well, rather a lot, actually. And it’s even better when the two work in harmony. Inspired by a recent report on the fastest-growing UK retailers in 2018, we take a look at the importance of direct interaction for consumers. The UK’s Top 30 Growth Retailers 2018 – produced by Retail Week and O2 Business – has found that “face-to-face interactions are proving to be just as vital a part of the customer experience in today’s digital era”. The report particularly highlights the value of technology and its usefulness for both in-store employees and shoppers, asserting that it is “vital for companies to understand the impact that improved connectivity brings to their business and to their customer’s experience”. Several high-scoring fashion and lifestyle e-retailers are engaging in sales activity across multiple channels, with a strong focus on convenience. Farfetch (ranked #1) has recognised that most sales still take place within physical outlets, so its Store of the Future concept offers click-and-collect and drop-off services; as well as stock tracking systems that work with a consumer’s mobile app as they browse. Meanwhile, Oliver Bonas (ranked #10), has linked its back-end stock systems with online collections and uses tablet computers as mobile tills, all connected via wi-fi hotspots and powerful in-store broadband connectivity. The display flexibility desired by Missguided seems to be working well for several other brands, too. Made.com (ranked #3) links showrooms with its online forum, where customers share images of furniture in their homes; while Matchesfashion.com (ranked #8) operates stores using iPad point-of-sale systems, so staff can circulate freely, monitor availability and respond to consumer interactions with personalised assistance. Why are retail stores still so important? 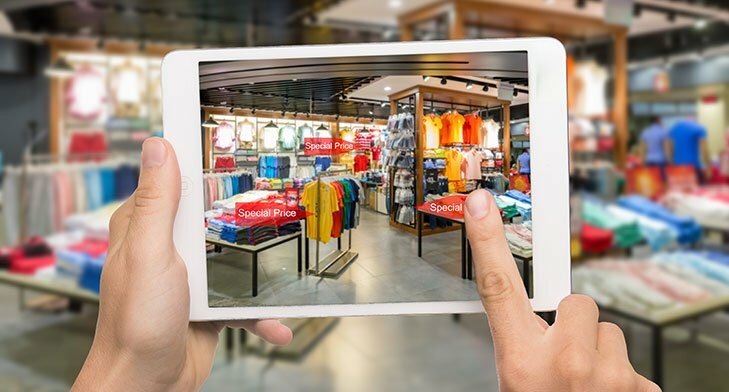 Let’s face it: There are certain types of product – including personal technology, fashion and furniture – that consumers will often wish to see and touch before committing to a purchase. Someone may be attracted to an item online, but then want the reassurance of admiring it in person; and ideally within a relatable context. For example, a chair displayed in a living room ‘scene’ in a showroom could help them to imagine how it might appear in their own space. And, of course, there’s only one way to find out whether it’s comfortable. As noted by the likes of Made.com and Missguided, this sort of experience relies upon a well-connected experience between online shopping and physical outlets, complimented by flexible store presentations that can respond quickly to changing trends and consumer desires. Retail display options such as tension fabric systems can be used to display ever-changing graphics and hold sales accessories such as digital screens, while the likes of freestanding fabric walls and light boxes can be moved around to divide a retail space as needed. If you’d like to future-proof your retail store with a flexible layout, have a chat with our friendly to find out more.